A fine and clever addition to the series. Hotel Transylvania 3 is okay. It’s fun and light and doesn’t require much thinking. Which is pretty much the overall characteristic of all three films in the series. The theme of acceptance is still there, but With this one there’s actually a lot that’s different. First of all, the character leave the hotel for most of the movie. In the second film there was the small road trip to a camp, but otherwise they were at the hotel. And this third movie takes place almost entirely on a cruise ship. Dracula gets the main story here, involving a romance and a mortal enemy. But the problem is, that leaves little room for stories for anyone else. 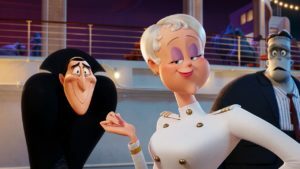 The previous two movies found ways to give lots of characters stories, (at the very least, there was always one for Dracula, Johny, and Mavis.) Here, it’s really only Dracula, and that becomes a problem. The movie is still fun and energetic, but it’s not quite as strong as the other two. 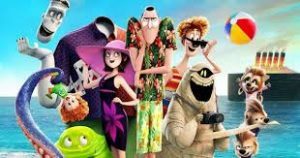 Let’s be honest, in a time like this where animated movies tend to be off the charts clever, and where the last five years have given us some of the best animated films in the last two decades, (Wreck It Ralph,Frozen, Moana, Coco,) nobody is going to call the Hotel Transylvania series a masterpiece. And it’s not. There’s nothing genius about this franchise, and there never has been. But as a kind of B movie, younger brother series to those heavy hitters, there’s a good amount of fun to be had with this. And that goes for all three films. The third movie is about on the level as the other two. It does feel different, because it’s the first movie in the series that really leaves the hotel, but for the most part, it’s more of the same. The first movie was all about the hotel. The storyline there was about Mavis and Johnny falling in love, and their romance began and took place all around the hotel. The second movie was mostly there. It started and ended in the hotel, but there was a small mid section that took the characters on a departure to a children’s camp out in the woods. If that movie was the breaking ground to have the characters leave the hotel, then in this third movie, the flood gates have opened. Consider the second movie the bridge, and this third one to be a complete departure. This time, it’s all ad a cruise ship. It would be nice to be able to say that there’s strong motivation for the characters to go on a cruise, but there really isn’t. Dracula, (Adam Sandler,) looks tired. He needs a break. His whole life is about showing other characters a vacation, when they come to his hotel, but what about him? When does he get to take a vacation? These are the kinds of questions that are raised, and they’re fine, but no points for having a genius plot here. Before our characters reach that point, of looking for a vacation to take, two things happen. First, we meet Van Helsing, the monster hunter, who will stop at nothing to catch or kill these creatures. Second, we get a wedding of two characters we haven’t really spent much time with before in the previous movies. It’s not the blob who is getting married, but more like a distant cousin, slime-like and covered in spikes. And when his bride (who also looks like him,) gets cold feet, all hell breaks loose. It’s meant to be a funny opening scene, to introduce us to the characters, but really it’s kind of a waste, since the scene does nothing to further the plot. We meet Van Helsing on a train, as he comes on board looking for monsters. They are all there, in disguise, and once he finds them, we get a chase and a fight. And then the movie cuts to some back story. Apparently Dracula has been fighting Van Helsing for decades. He has taken out all of Van Helsing’s family members. And then we cut to scenes of each of his ancestors hunting Dracula and then dying. But there’s only one catch. They all look exactly the same. Usually in this situation, there’s a little bit of variance to make it clear that they are different members of the same family. But this movie doesn’t do that, and so we are left wondering if possibly they all were the one Van Helsing, and he just didn’t die from any of those. The reason why the Van Helsing story is important is because Dracula and his family members board a cruise and it turns out to be run by Van Helsing’s daughter. His family has sworn vengeance on Dracula, and now she’s about to get it for them. Only there’s a problem. Dracula has fallen head over heels for this character, Ericka, and he’s so nice to her that she has trouble resisting him. She’s caught in a conflict, being torn between her feelings for Dracula and her allegiance to her family. The story between Dracula and Ericka is pretty good. It’s nice to see what she deals with during the course of the film and how it changes her. The problem is that there really isn’t much of a story for anyone else. It’s not that the previous movies were ever big on giving other characters stories, but at least they tried. They always gave Mavis and Johny their own story, separate from Dracula’s. In the first movie their romance was the main story. In the second film, while he was off trying to convert their son, Dennis, into a monster, they were off exploring California and considering living there. Here, in the third movie, they’ve got nothing to do. And neither does anyone else. The other monsters are simply there to make quick jokes. But the way that Griffin, the invisible man, (voiced by David Spade,) had a story about an imaginary girlfriend in the second film, for example, is non-existent here. The only one who does have a story, besides Dracula, is Dennis, who has to keep his giant pet monster dog hidden and disguised at all times. Other than that, we’re limited to Wayne (the werewolf,) sending his kids to Cruise camp and walking away with the ability to do whatever he wants. So what does he do? Stand there and repeat that he can now do whatever he wants. Again and again. With such a limited story for the other characters, this movie does fall somewhat short of the previous films. It’s nice to see Dracula have a love interest for once, (considering he is the protagonist of all three films,) but who knew that in order to do that the filmmakers felt they needed to cut back everyone else’s story to just about nothing? Dracula’s story is fun, and it does carry on the overall theme which has characterized this series so far. Acceptance. In every movie, there’s a character who starts out hating another one and then learns to accept and appreciate him. The first two films were similar in that the idea was monsters vs humans, and monsters not accepting humans. In this third movie, with the Van Helsing arch enemy situation, things get a little more complex. In that department, this movie definitely succeeds.